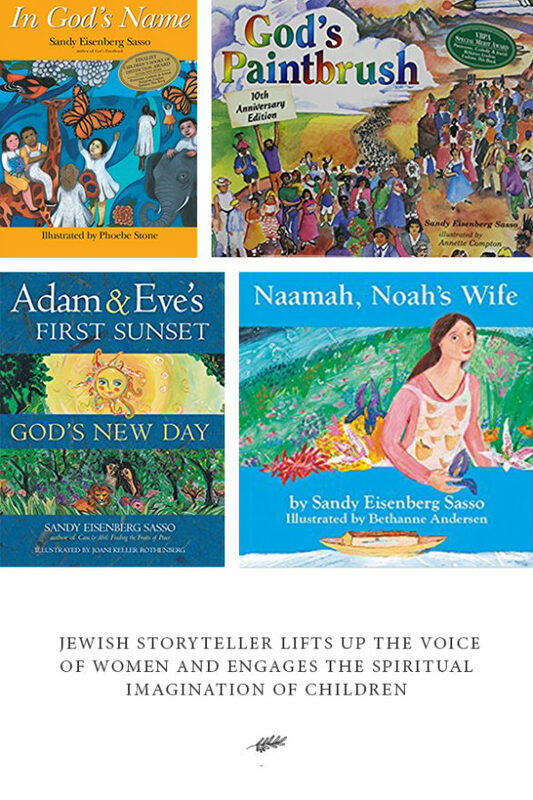 I first met Rabbi Sandy Sasso through her children’s books: In God’s Name and Noah’s Wife: The Story of Naamah. At that time (and still today) I was looking for books that would help me explore spirituality and G-d with our young daughter. Reading her books gave me the goosebumps because they were at once simple, beautiful and spiritual. Also, it feels so healing and vital to read midrash about the women from the Bible. It’s with great honor (and excitement!) that I share this interview with her. From the time I was a young teenager, I was deeply interested in Judaism. When I was 16 years old, I told my closest friends that I wanted to be a rabbi. It was 1963. Because of an incredible rabbinic mentor (Rabbi Bertram Korn) and a supportive family, what was simply an unlikely dream became a reality. In 1974, I was the first woman ordained from the Reconstructionist Rabbinical College. After serving three years in a congregation in Manhattan, in 1977 my husband, Dennis, and I became spiritual leaders of Congregation Beth-El Zedeck in Indianapolis. We were the first rabbinical couple in world Jewish history. After 36 years, in 2013, I retired from the congregation to pursue my interest in writing and the intersection of the arts and religion. I created the Religion, Spirituality and Arts Initiative at Indiana University Purdue University at Indianapolis (IUPUI), which brings together artists from diverse artistic disciplines and religions for sustained study and reflection on a select biblical text. By studying with faculty in the fields of music, literature, visual art and religious interpretation, the participants find inspiration to create new work that is later shared in a community exhibition. After retirement, I have devoted more time to the writing of children’s books and co-founded Women4Change Indiana, a nonpartisan, grassroots organization whose mission is to mobilize women to engage effectively in political and civic affairs to strengthen democracy and advocate for the leadership and dignity of all women in Indiana. I regard myself as a storyteller, a gather of ancient narratives and a creator of new ones. Lifting up the voices of women, providing children a language for their spirituality and fashioning new midrash are part of my life’s work. When my son and daughter were young, I couldn’t find anything in children’s books about faith that I wanted to read to them. There was great children’s literature, but when it came to talking about God and faith, the stories were preachy, narrow and not very engaging. I began writing stories for children because I found that in most religious institutions God was missing, at least the kind of God I could believe in. I wanted to write books that engaged the spiritual imagination of children. At that moment, I knew that I wanted to write something about God that honored the rich imagination of children and help them see the divine in images that went beyond the graying grandfather. I never thought what I wrote at the time would ever became a children’s book. It took six years and many rejections to finally find a publisher. What are children’s main questions? Children have big questions! Why is life sometimes unfair? What happens when you die? What is real; what is true? They want to talk about loneliness, difference, and about God. Sometimes we dismiss these questions or try to avoid them. On the one hand, we do not think children are ready for that kind of discussion. On the other hand, we are not really sure what we believe, so we don’t know what to tell our children. The truth is that children aren’t as interested in the answers as they are in the conversation. They love mystery. They aren’t afraid of questions without answers; we are. Is God an idea children can understand? Children have a deep spiritual life. What children don’t have is the language to express it. People often think that they need to tell young people what to believe. But what is most important is to help them have a conversation about their own faith journey. That is what story does. It is hard to use simple language to convey a complex and difficult topic. God is one of those topics. It is easy to hide behind philosophical and abstract language. But God is more than idea. God is an experience, a process at work in our lives, the hope and courage to do what we might not otherwise be able to accomplish. We should never underestimate the capacity of children to understand this. One of my favorite philosophers, Martin Buber, wrote about the philosophy of dialogue. He spoke about the importance of relationships and connections, which he described in I and Thou. This book has had a powerful influence on me. I decided that I wanted to write a children’s book about I and Thou. I really wasn’t sure that it was possible. After God in Between was published, a Butler University professor told me ‘I read your book in class today’ I said, “You did!? Why?” and he said ‘It’s I and Thou, isn’t it?” You can have these big conversations with children. The question is the language you use. E.B. White, the author of Charlotte’s Webb reminded us “Anyone who writes down to children is simply wasting his time. You have to write up, not down.” It is a great responsibility and honor to try to do just that. My books are meant for people of all faiths and those who profess no particular religious identity. There are many good books about specific religious traditions. I did not need to do that. I wanted stories that were open enough to speak to all children. To be able to engage children from different communities of faith has been an extraordinary experience. Children view the stories through their own lens. They help you see the story through their eyes of wonder. Favorite woman from the Bible and what have you learned. I have always been fascinated by the story of Miriam. She teaches what it means to be a sustainer despite rejection from the very group you serve. During the long desert journey after the crossing of the sea, it was Miriam’s well that sustained the people through the wilderness. Even when she was shut out of the camp for complaining against Moses, her well continued to sustain the life of her people. She teaches us to find ways to keep our anger from destroying community. As powerful as Miriam’s well, was her tambourine. The tambourine seems like a strange choice to carry with you when you are leaving Egypt and facing the prospect of raging sea and arid desert. The seemingly frivolous musical instrument did something that nothing else could have accomplished. It made the sound of hope. She teaches us never to underestimate the power of music, poetry and story. She had no map, but she knew what was needed at the moment. Why is it important to give women in the Bible a voice? When we only listen to the ways men have understood what is holy, we miss half the story, what it means to live in the fullness of the sacred. Biblical pilgrimages are always up some mountain, on a ladder, alone. It is so easy to slip with no one to catch your fall. Allowing women to speak their stories, gives us a glimpse of other forms of sacred journeys. What would it mean to imagine what those missing voices might have said? What did the women hear at Sinai? Who was Noah’s wife, Lot’s wife? If we could hear their side of the narrative, we would learn more about ourselves and about God. If all the voices in the Bible are male and the Bible is our sacred text, it says something about what and who is of most value. My work with reinterpreting biblical text about women also translates into building a contemporary community where women’s voices are heard. How has your relationship with God and spirituality changed over the course of writing these books? God is not an idea that I need to understand but an experience I seek to name. I often tell the story of how my father used to carry me over the waves in the ocean when I was afraid of the water. His arms were like God’s arms that carry me over my fears until I am able to stand up again on my own. The question is no longer what is God or where is God but when is God. What about stories that make them so powerful? Stories are the first language of religion. You cannot replicate the religious experience but you can tell its story. Story is then enacted in ritual and liturgy and later reflected upon in theology. The closest we come to the original experience is through story. Narrative is the way we make sense of our world, how we cement communal bonds. We learn facts, we remember stories. Franz Kafka said, ‘Books are the ax for the frozen sea with us.” Stories touch the deep places in our souls and open us up in all kinds of wonderful ways. Did you envision the success of your books? Why do you think they resonate with so many? I am continually grateful for and surprised by the large readership of my books. When I could not find a publisher for my first manuscript, God’s Paintbrush, I almost trashed the folder in which I stored it, but my husband encouraged me. The time was ripe for spiritual books for children that did not give a sermon or presume to know everything about what you should believe. There were so many spiritual books for adults but few thought that children had the capacity to understand that kind of writing. I believed otherwise and took a chance. Telling stories to children, talking with them about the big questions has been a great gift that I continue to unwrap every time I have the privilege of telling a story. Have you thought about writing about God for adults? Why? Why not? I have written and edited for adults. My two adult books are Midrash-Reading the Bible with Question Marks and Jewish Stories of Love and Marriage (co-authored with Peninnah Schram). The Midrash book includes theological reflection for adults. I have also authored a number of chapters in other anthologies and edited collections on the spirituality of children. There are many wonderful books for adults about God. There are far fewer for children. I think I can make my greatest contribution in children’s literature. But children’s books are not for children only! They can help adults discover a new way of thinking about God! One of my favorite books is Dara Horn’s, The World to Come. It is a celebration of power of the imagination. It is an extraordinary piece of storytelling. I love the poetry of Alice Ostricker, especially the books: The Nakedness of the Fathers and For the Love of God- The Bible as an Open Book in the ways it transforms biblical tradition to gives women a voice. Judith Plaskow’s Standing at Sinai: Judaism From A Feminist Perspective has been foundational in forming a feminist theology. Your turn: Which part of Rabbi Sasso’s interview is the most meaningful to you?